Bill Richardson: 'Aung San Suu Kyi Needs To Start Listening' : Parallels Myanmar's leader has "moved in a dangerous direction," the veteran negotiator tells NPR. "She doesn't want any dissent," he says. "She's got to change." 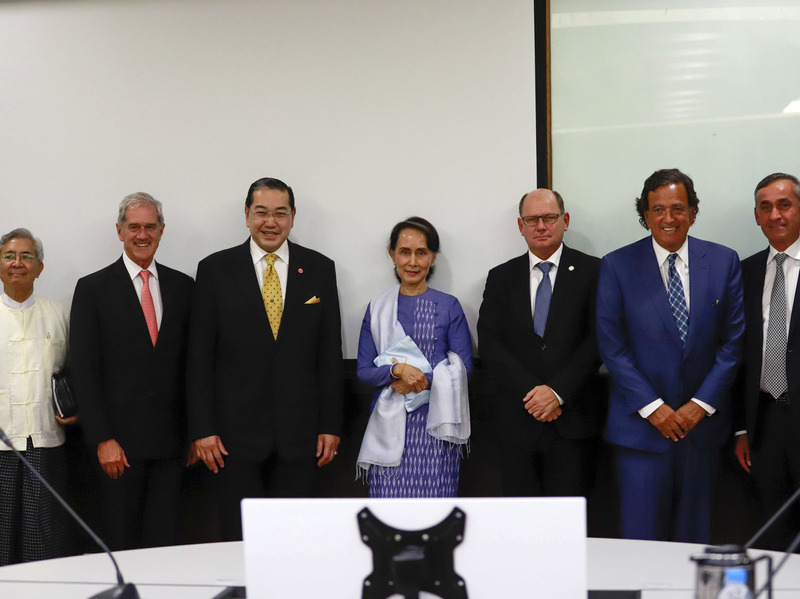 Aung San Suu Kyi (center), poses with Bill Richardson (2nd right) and other members of the Advisory Commission on Rakhine State after their meeting in Myanmar on Monday. Richardson, also a former New Mexico governor and congressman, was in Myanmar for meetings between the Advisory Board on Rakhine State and Suu Kyi. The board — which Richardson joined at Suu Kyi's invitation — was set up to implement the recommendations by an advisory council led by former U.N. Secretary-General Kofi Annan regarding the Rohingya, a brutally persecuted Muslim minority in Myanmar. The Rohingya crisis was just one issue Richardson had planned to discuss with Suu Kyi and other government officials. He also wanted to seek the release of two Reuters journalists who face up to 14 years in prison for allegedly violating the country's colonial-era Official Secrets Acts. But when he recommended that Myanmar free the two journalists, Suu Kyi "exploded," Richardson tells NPR. For that and other reasons, he decided to step down. "I cannot in good conscience serve in this role," Richardson said Wednesday in a statement, in which he also accused Suu Kyi of lacking "moral leadership" and slammed the board for becoming a "cheerleading squad" for the Myanmar government by helping it "whitewash" the Rohingya refugee crisis. The Myanmar government said that Richardson's resignation amounted to a "personal attack" on Suu Kyi, and accused him of over-stepping. Suu Kyi's office later claimed Richardson was asked to quit the advisory board, something he denies. Other members of the advisory board accused Richardson of rushing out of negotiations too quickly. Meanwhile, the humanitarian crisis along the border of Myanmar and Bangladesh continues to grow. More than 700,000 Rohingya Muslims have fled Myanmar since August, following a brutal military campaign launched in response to an attack by Rohingya militants on Myanmar police. A plan to repatriate the Rohingya who fled in this latest exodus was supposed to begin this week, but has been delayed. It's now even more important for the international community to start assisting in Myanmar, Richardson tells NPR. And if Suu Kyi can't take advice even from her friends, he warns, "The situation in Myanmar is going to get worse." Aung San Suu Kyi had asked me to serve on this panel. I was expecting, when she asked me to serve, to be able to offer candid advice on the situation with the Rohingyas, the refugees, the human rights atrocities, the problems. And I get there, spend a few days and find out that it's kind of a whitewash, that it's kind of a cheering squad that she wants. And I give candid advice — release the journalists, conduct human rights inquiries — and she gets very, very upset. So for that reason, I resigned. When I made the recommendation that she release and swiftly deal with the journalists because it was a very bad image for Myanmar, she exploded. She interrupted me. She yelled, "That is not your mandate, Bill. That's not the mandate of the advisory commission." I said, "It has to be the mandate, because we're to implement the recommendations of Kofi Annan, which say you have to have a free press, free flow of journalists, to look at some of the problems in Rakhine and with the Rohingyas." And she was very upset that I raised that. It's very clear that these journalists had discovered mass graves, and for that reason, it seems they were put in jail by the military. That's the problem. And she refuses to see that, she doesn't have advisers around her that are honest with her. I've been a very strong supporter [of Suu Kyi] for 30 years. I supported everything she's done. Now I suspect she's very upset at me, but maybe I'm sending a small signal to her [with my resignation] that she's got to change. Aung San Suu Kyi's very bright. In the past, she's shown great resolve, great courage. She was incarcerated and I helped get her out of house arrest when I was a congressman, and I helped, when I was in the Clinton Cabinet, put [U.S.] sanctions on the [Myanmar] military. She was always very calm and measured, but it now seems that when she's a head of state, she has become a little bit arrogant with power: "I could make no mistake, that I'm infallible, that I don't need any advice, especially tough advice." She doesn't want any dissent. She doesn't want any advice or bad news and I think that's what's causing her enormous problems. She blames everything on the United Nations, the international community, human rights groups, the media. Nothing is her fault or her government's fault, and that's become a real problem, in my view. I mainly have dealt with dictators that are unfriendly to the United States — Saddam Hussein, the North Koreans, the leaders of Sudan. They feel they're infallible. But Aung San Suu Kyi, I don't want to put her in that category. She's moved in a dangerous direction, but she's always been an open democracy activist. It's just that now that she's dealing with this issue, she's become very intolerant of criticism. Hopefully she'll change. Maybe my little outburst will open her eyes and there'll be some changes. I think there has to be fair treatment, honest treatment of the [Rohingya] refugees. I think the international community has to assist more. But it's very hard when they're not allowed access. The United Nations is given very limited access and I think that's a mistake. I think countries that are surrounding Myanmar, the Indonesians, Thailand, the ASEAN [Association of Southeast Asian Nations] countries, need to step up and put some pressure on Myanmar and help [Suu Kyi] get out of this morass. Otherwise it's going to be an unspeakable human tragedy. The world has to start speaking up, and Aung San Suu Kyi needs to start listening.